The Anglesea Bike Park was built in September 2006 and at that time was Victoria’s first professionally designed Mountain Cross (or 4X) track. The Bike Park was the result of years of successful lobbying by local riders and the Anglesea community. The Surf Coast Shire and Alcoa, in partnership with the Anglesea community, made it possible for this facility to become a reality. The construction of this track adds to Anglesea’s reputation as an emerging outdoor activities town. The Anglesea Bike Park was designed and built by legendary trail builder Glen Jacobs of World Trail and was Victoria's first professionally designed and world class 4X track. The track consists of straights and switchbacks and is about 400m long. Various track features have been included to enable users of all skill levels to safely enjoy the track. The features include mounds, rollers, jumps and table tops and these vary in height from 200mm to 1800mm high. 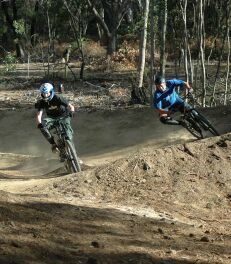 Other features of the Anglesea Bike Park include a dirt jump area and a skills course with log rides. The Bike Park is suitable for riders of all ages and level of experience. The Anglesea Bike Park is ideally located, just 1 kilometre from the town centre, accommodation, restaurants, cafe’s, public transport and surf beaches. The region boats a strong cycling culture and the Anglesea Bike Park ensures a big future for mountain biking on the Surf Coast. The park is set into a hill with the natural slope offering the ideal contour for a Mountain Cross Track. Tall pine trees surround the track, providing a picturesque and shady environment – great for both riding and for spectators. A toilet, shelter and picnic area are recent additions to this fantastic bike facility. The site address is 80 Camp Rd or Melways Ref 196 G4. The Anglesea Bike Park proudly sponsored and supported by local community and organisations.